When recently with the blessings of Guru you participated in the Golden Temple Kar Sewa. It immediately refreshed our memories of your grand father and mother participating in the Kar Sewa of Gurdwara Kartarpur Sahib in the nineteen thirties when the shrine was threatened by Raavi floods. 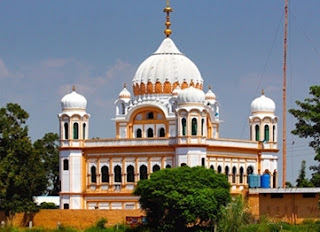 As you know Kartarpur is a unique shrine where exist three tombs of a single prophet: Guru Nanak. Kartarpur the shrine is unique in many aspects. It is the birth place of Sikhism. It is the place where he stayed for maximum amount of time of his life; 18 years. It is also the place where he passed away merging with the supreme soul. Kartarpur is just 2 kms. from Indo-Pak border on the right bank of river Ravi in Pakistan territory. It has remained virtually abandoned for the past 56 years. Wild grass has been seen growing on its floors and so has wildness been witnessed in the international relations for half a century now. Otherwise the poorer nations India and Pakistan have been spending most of their budgets on arms and ammunition. We learn Pakistan has in the year 1999 cut the grass and swept the pious floors of Kartarpur and so has happened a miracle of initiation of peace process. Because you are a highly religious person and the basic philosophy of religion is that there is 'jot' the element of God in every individual. The humanity has been craving for union in the last century but the rulers had been laying barbed wires to prevent the union. This fact of Kartarpur being the universal point was brought in the notice of Pakistan by the Sikh sangats overseas and the Pakistan Govt was prompt to declare its intention of granting a free corridor for Punjabis. But unfortunatly the Sikh leadership didn't reciprocate in the appropriate measure. Guru Nanak has since showered blessings on you and now you represent the Punjabis, we appeal to your highness to please take up this issue with the Central Govt and provide the most sought after opportunity of darshans to the crores of Sangats. For your kind information the corridor being sought is very practical one because the shrine is not far away from the border just two kilometer from us. Besides the whole passage is visible to naked eye and is not inhabited. We appeal to your highnesses that please see that this golden opportunity is not wasted or missed. For your kind information this shrine is a universal point on earth which can't be confined to any country or nation. Even, Sir Ceril Radcliffe who drew boundary-line between India and Pakistan in 1947 could not divide Kartarpur. People know that as per June 3, 1947 declaration the whole of Gurdaspur distt. was given to Pakistan which meant that Kartarpur had gone deep in Pakistan territory. But the division didn't work and had to be revised. Radcliffe bisected Gurdaspur in such a way that Kartarpur was exactly on the borderline. This is an open miracle and the story of Kartarpur is full of miracles. For your kind information on March 7 instant there concluded the Chola Sahib festivel at Dera Baba Nanak and the newspapers reported that about 10 lakh people had had darshan from distance of this rare shrine. This non-political body the Sangat appeals to you to please feel the pulse of the silent millions and kindly consider this demand of the people. Please make a declaration of your open support to this international cause. If possible a resolution by the your Cabinet may be passed for this noble cause. It is natural law that hatreds between the nations don't remain for ever and the sparkle of Sun of international peace is already visible. Please make this pious initiative. May Guru bless you with insurmountable strength sound health and happiness.